The first time each turn the Runner loses or spends click during a run, you may add 1 card from Archives to the top of R&D. Interweaving the Past and the Future. Well no one else has reviewed this yet so lets give it a try. So, the age old question when looking at a new HB id: why am I not just playing EtF? The 45/15 setup is pretty standard so lets see if we can do something good with this weird recursion ability. First thing is getting it to actually fire. Plenty of bioroids, perhaps enigma or Turing, not sure any of the other lose a click ice is worth it. Nothing terribly unusual. There's also upgrades like Mason Bellamy but he and the combo's he goes with are unreliable and easily played around by a good runner. If your opponent is good your ability mostly reads "opponents can't spend clicks to break ice". Still not bad. Runs are a bit trickier and more expensive unless the runner really needs to get in right then. Those hail mary end of game runs do not care. Now lets say you do get the ability to fire; what to get back? HB already has Friends in High Places so most of the time assets upgrades and ice are better played right onto the battlefield (and if you are EtF you get a cred back too). Unless you have some weird reason you want these cards in hand instead of in play (the Twins? if you're feeling the jank combo) the main targets you'll want is gonna be powerful operations. The other HB id's cover other deck types already anyway. Econ ones (Hedge Fund, color clearances, perhaps even restructure) are nice but only keeping up with EtF at best. You'll need things with a higher impact. Think Biotic labor for scoring, or great imported operations from other ID's. If you can get this ability to trigger the runner should be panicking cause something bad is coming. Couple other notes, the fact that the card goes to RnD can slow down flood if thats a problem and choosing what the runner will access is always nice. Could throw a couple traps in just for that purpose. Overall the unreliable ability will probably hold this ID back from every being a big thing but the unique way it plays and makes the runner weigh decisions is a lot of fun. I've tried a few times to make a deck with this ID, and it isn't easy. 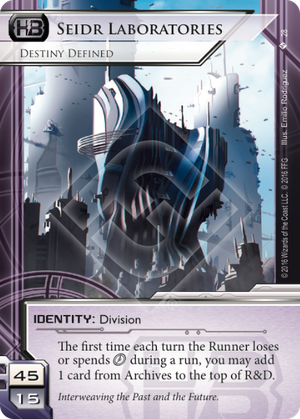 The ability leads to interesting interactions with the runner, and I consider it one of the most interesting corp IDs printed. Using cards like Tapestry and Eli 2.0, you can immediately draw used econ cards, put a snare on top of R&D mid run, or recur nasty assets. Unfortunately, as with every other non-core HB ID, you need to be getting a lot out of the ID's ability, or else why not just play core EtF? This is doubly problematic with this ID, as there are very few ways to force the runner to lose a click. If you use Bioroid ice as means to trigger the Seidr, you have to have a lot of 1.0 ice to allow click 3 runs with chances to click for subs. Good runners will still avoid clicking through your ice, and will prefer simply paying for subs after initial face check. If you use non-Bioroid ice with "lose a click" subs, you are still likely to only trigger it on a lucky face check. If you rely on Mason Bellamy, the runner will just run last click to avoid losing all their clicks anyway. You run Ronald Five and tons of asset spam. Here you lose out on the 1 credit a turn from ETF (which is practically guaranteed in asset spam HB), and will only trigger as long as Ronald Five is rezzed and active, so you'll need to put him in a well iced server. If anyone sees any other main options, let me know, but from my perspective, the best bet is Ronald Five asset spam - which still is probably better in EtF. If you really want to be cruel, recur Friends in High Places. I've seen decks that try this though, and you end up cutting stronger assets for more econ cards as a result of losing Etf credits. In the end, the ID makes for infrequent and interesting choices which are largely overshadowed by the infamous core HB ID.